Laurie Alpert just sent me news of this project, Al-Mutanabbi Street Starts Here: A Response to the Violence in Iraq from the Letterpress and Book Arts Community, and exhibition at the Cambridge Arts Council, Cambridge, Massachusetts from January to June 2013. 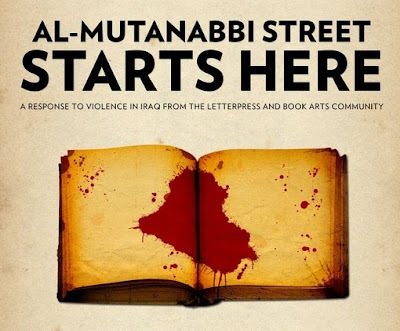 The project was created by Beau Beausoleil to respond to a car bombing in March 2007 Al-Mutanabbi Street, a mixed Sunni Shia area and the historic center of book selling in Iraq. On March 5th 2007, a car bomb was exploded on al-Mutanabbi Street in Baghdad. Al-Mutanabbi Street is in a mixed Shia-Sunni area. More than 30 people were killed and more than 100 were wounded. Al-Mutanabbi Street, the historic centre of Baghdad bookselling, holds bookstores and outdoor bookstalls, cafes, stationery shops, and even tea and tobacco shops. It has been the heart and soul of the Baghdad literary and intellectual community. The Al-Mutanabbi Street Coalition is issuing a call to book artists to work on a project to “re-assemble” some of the “inventory” of the reading material that was lost in the car bombing of al-Mutanabbi Street. The coalition asks each Book Artist who joins the project to complete and donate three books (or other paper material) in the course of a year, books that reflect both the strength and fragility of books, but also show the endurance of the ideas within them. As in our broadside project, we will be donating one complete set of 130 to the Iraq National Library. The other two sets will be used in conjunction with shows of the broadsides as well as in shows of their own to raise funds for Médecins Sans Frontières (MSF). Each book artist will have one year from the date they join the project to complete their three books. The inventory of al-Mutanabbi Street was as diverse as the Iraqi population, including literature of both Iraq and the Middle East, history, political theory, popular novels, scholarly works, religious tracts, technical books, poetry, mysteries; even stationery and blank school notebooks could be purchased on this street, as well as comics, and magazines. Arabic was of course the predominate language but books in Farsi, French, German, Spanish and English were also represented. I imagine there were a few books in Chinese, Japanese, Korean, Dutch, or Italian, as well as classic Greek and Latin, Hindi, or even Russian. Your own text for this project can reflect the multiplicity of this linguistic crossroads. al-Mutanabbi and its printers, writers, booksellers, and readers, as a touchstone. You can read articles, view books, and watch videos at Al-Mutanabbi Street Starts Here.